From Abba to Zappa, this jobsite radio has it covered. 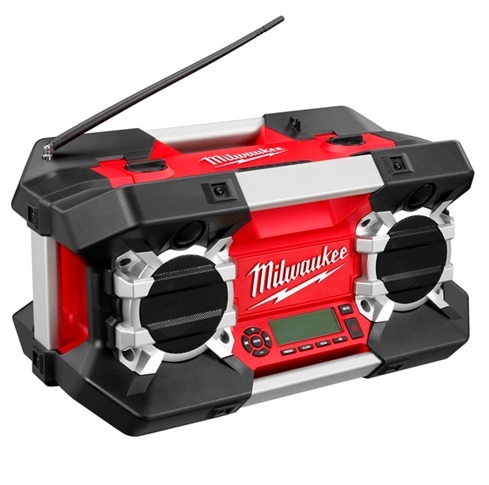 Milwaukee’s 2790-20 jobsite radio is a rugged, well built, quality sounding radio that’s meant to take the bumps and bangs of the jobsite and still perform exceptional well and it does. It also makes an excellent workshop radio. First and foremost, let me get this out of the way, this radio does not double as a battery charger and that’s fine with me. 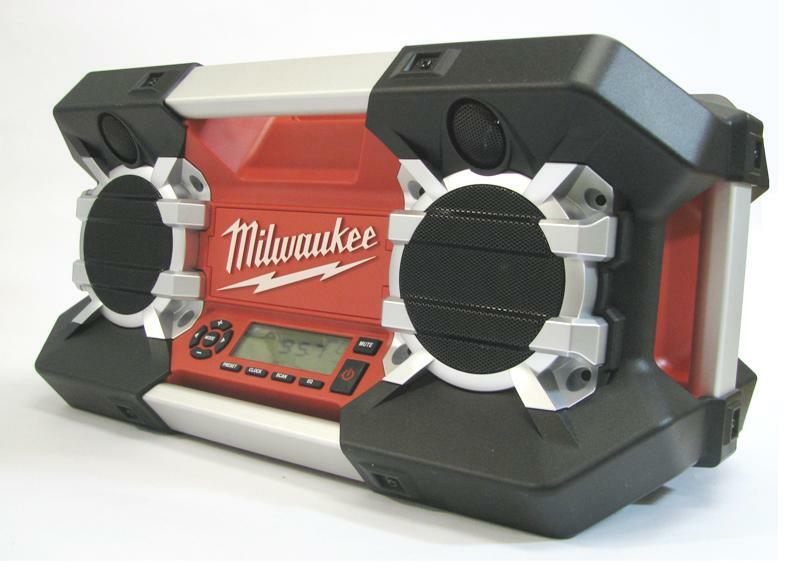 This radio runs on practically every Milwaukee battery out there. 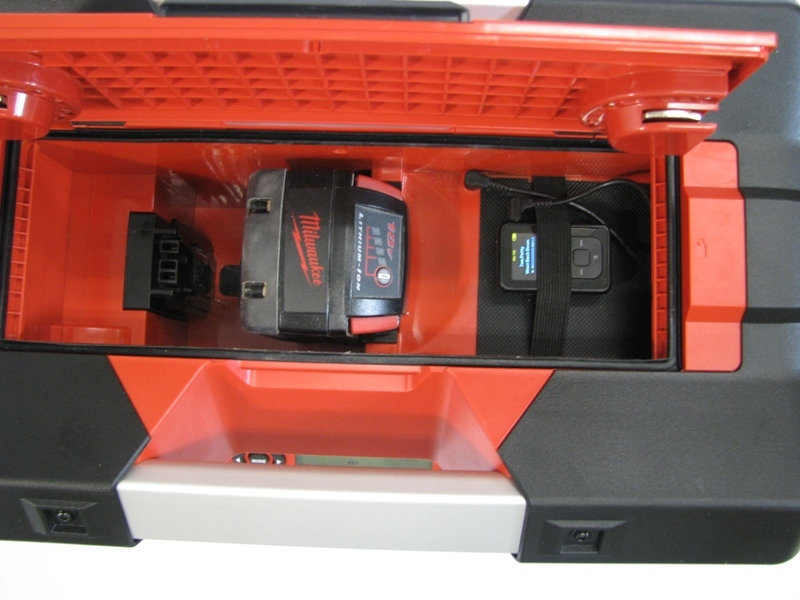 The 2790-20 can be powered by Milwaukee’s M12, M18, V18, V28 and the NiCad 12V to 18V batteries. It even runs on a regular household AC voltage. Milwaukee has built into this radio plenty of options to power this radio on the job or in the shop. 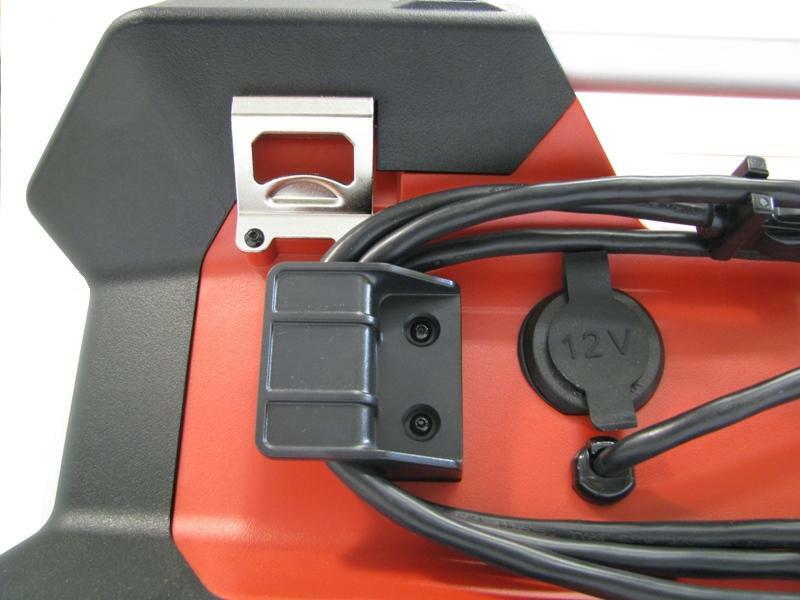 The battery/auxiliary compartment is located on the top of the unit and is accessed by turning the two compartment latches. 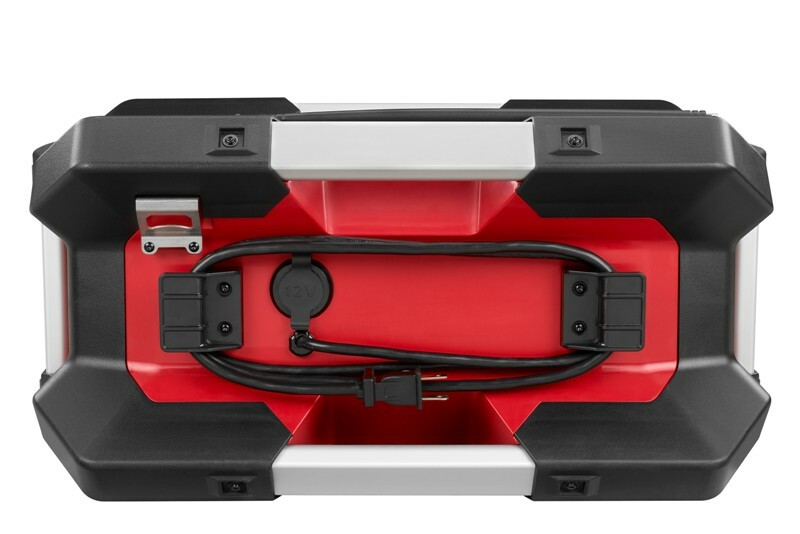 This compartment is kept well sealed from dust and the weather by two, positive locking latches and a soft rubber gasket. The 2790-20 has a host of features that make it a hit on the jobsite or in the workshop. 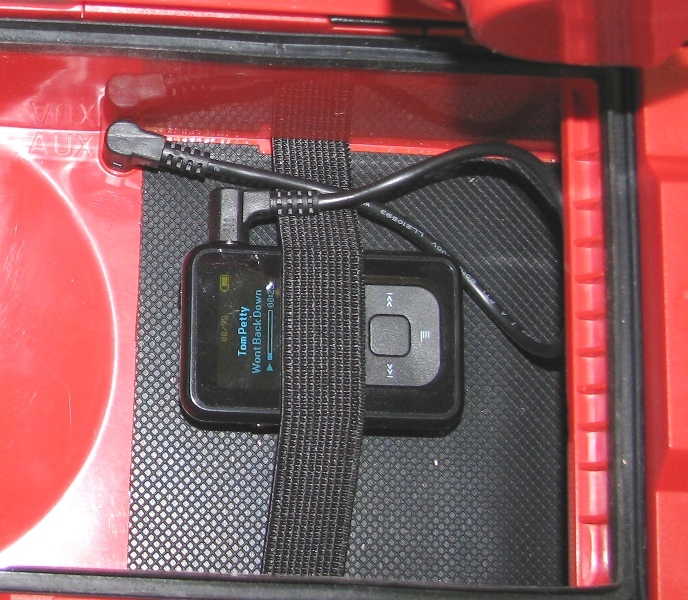 Found in it’s battery/auxiliary compartment is a 1/8” AUX jack that will connect to an IPod, Mp3 player, CD player or other listening devices. With the soft rubber mat and the elastic restraining strap, my MP3 player was well secured. 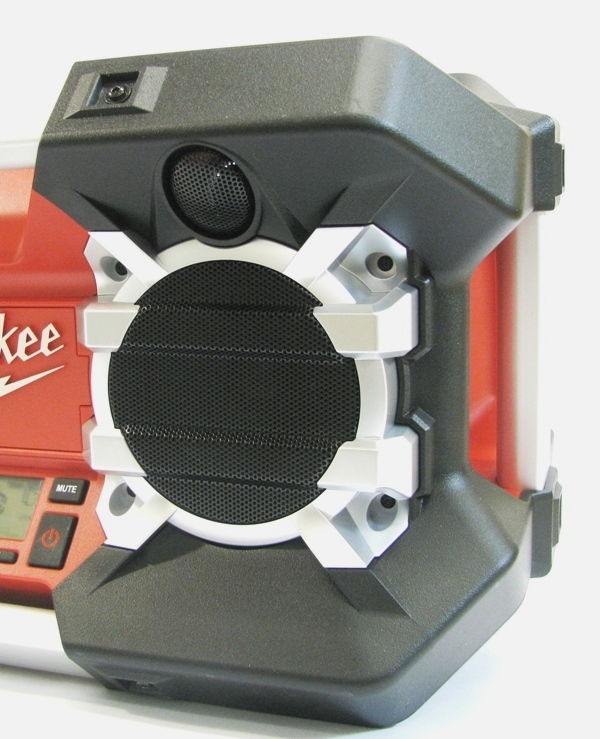 Located on the back of the radio is the 6’ cord storage, a bottle opener for those without twist off’s and a 12V DC output jack that can be used to power a CD player, charge a cell phone or any other device that uses less than 500mA of DC electrical current. And when you turn the radio over to reveal it’s bottom, there is a double A battery compartment that holds two double A batteries (supplied) that power the clock and the radio station presets when the unit is not plugged in on working off a battery. The “dashboard” located on the front of the radio is very user friendly and with it’s soft rubber touch pads, your fingers don’t slide off the buttons like they would on hard plastic…………….doesn’t sound like a big deal but when my hands were dirty or dusty and I wanted to make adjustments to the radio, it matters. The dashboard is straight forward to use with its 11 touch pad buttons. 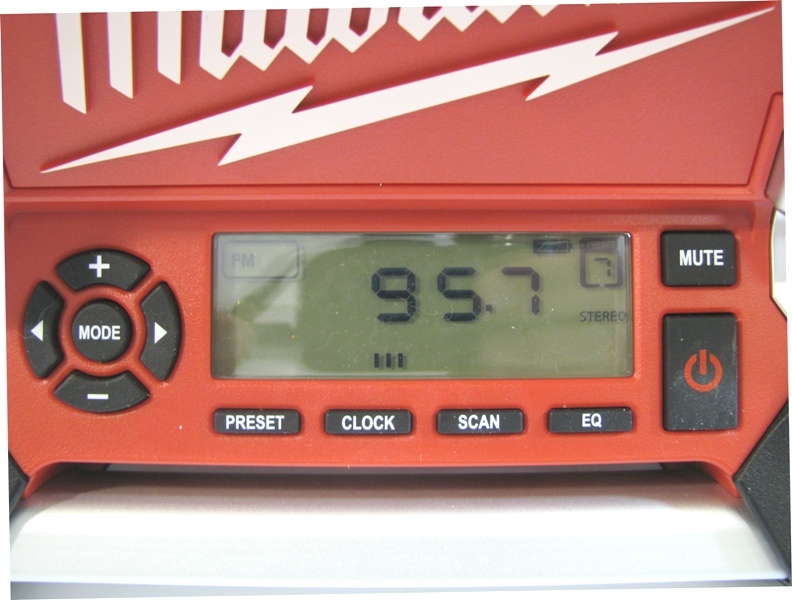 The AM/FM tuner with digital processor has 10 presets for AM and FM radio, volume control, a mode button that switches modes from AM to FM to the 1/8” AUX connection to drive an IPod, MP3 player etc., a scan button to scan radio stations, an EQ button that’s really a bass and treble adjustment, a power button to turn the unit off and on and a mute button to mute the music without having to turn off the unit. And a clock button to tell you when it’s quitting time. One of the nice features on this radio is its backlit display. Push any button of the radio and the LCD display lights up for 15 seconds that comes in handy when the sun is going down on the jobsite. Features are nice but the bottom line on the job or in the shop is sound, how does this jobsite radio sound? In one word, incredible. The sound quality is consistent from the lowest lows to the highest highs throughout the entire range of volume. And let me tell you, this radio has volume. 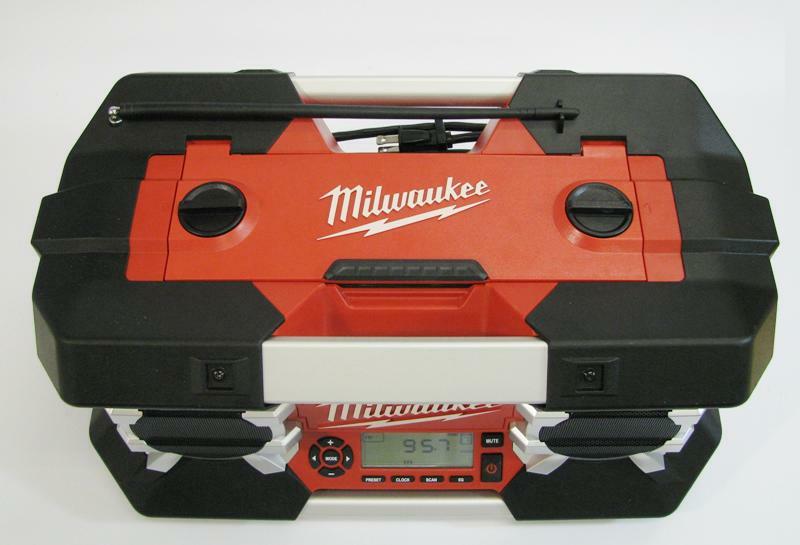 Powered by a 40 watt digital amplifier and pumping that power through a pair of 4” polypropylene woofers and a pair of 1” tweeters, this jobsite radio sounds sweet at low volume and cranked way up. A lot can be said about the durability and the shock absorbing ABS polymer and steel construction protecting this radio but I’ll keep it simple. I have inadvertently kicked this radio off the back of a truck, forgot it out in the rain and I’m sad to say, dropped it off of my workbench and it still looks and sounds as good as the day it came out of the box. 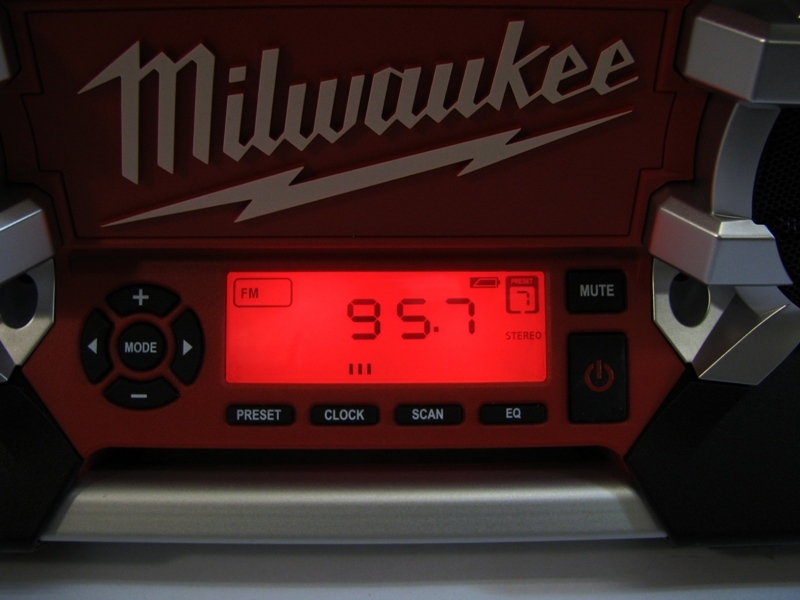 The Milwaukee 2790-20 Jobsite Radio is easy to use, tough as nails, has great features and sounds incredible. From the jobsite to the workshop and from Abba to Zappa, this radio meets and exceeds my expectations for a jobsite radio. This entry was posted	on at and is filed under Tool Reviews, Workshop Accessories. You can follow any responses to this entry through the RSS 2.0 feed. Both comments and pings are currently closed.